New home sales rebounded strongly last month on a monthly, quarterly and yearly basis. According to developers’ sales survey by the Urban Redevelopment Authority, new home sales rose 131.6 per cent m-o-m to 1,054 units in March. Including executive condominium (EC) units, developers sold 1,062 units last month, registering a 132.4 per cent m-o-m increase. New home sales excluding ECs were also 47.2 per cent higher y-o-y. For the first quarter of this year, new home sales remained resilient as 1,946 units excluding ECs were sold. This is 23.1 per cent higher than the 1,581 units sold in Q1 2018 (based on URA’s Q4 2018 real estate statistics report), although no cooling measures were implemented a year ago. New home sales in Q1 2019 were also 6.0 per cent higher than the 1,836 units sold in Q4 2018. 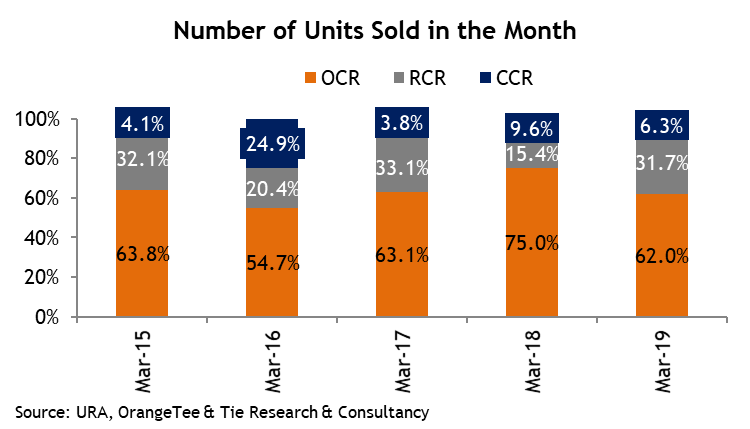 Last month, 1,812 private homes were launched, of which 170 were in the core central region (CCR), 576 in the rest of central region (RCR) and 1066 outside the central region (OCR). There were a few new project launches including Treasure at Tampines that sold 289 units, The Florence Residences (sold 77 units), Boulevard 88 (26 units), One Meyer (10 units) and The Essence (6 units). Higher m-o-m sales were observed across many ongoing projects such as The Tre Ver, Riverfront Residences, Parc Botannia, Stirling Residences, Parc Esta, The Tapestry, The Garden Residences and Whistler Grand. Sentiment was positive for the super luxury home segment as there was a significant pick up in the number of units sold last month. According to URA Realis data downloaded today, 25 new private homes were sold above S$5 million, the highest number recorded for a single month since December 2013. Of the 25 units, 20 were from Boulevard 88 and 5 were from Marina One Residences. For these 25 units, 10 were bought by Singaporeans while 15 were bought by foreigners. The highest-priced unit that was sold last month was a 28th floor 528 sqm unit at Boulevard 88 that was transacted at S$28 million or S$4,927 per sq foot. This is also the highest per square foot price transacted for a new sales unit since June 2013 (S$5,001 per sq foot at Reignwood Hamilton Scotts). Note: New launch refers to units sold in projects that were launched in Mar 2019. Existing launch refers to units sold in projects that had been launched in prior months.